Soloist for Private Dinner Party in London with quintet. (see Testimonials). Solos and chorus work in various venues in England, including weddings, concerts, etc. Soloist for a Special Dedication Service in St. Mary's Halton, Cheshire. Soloist at Lord Mayor's Prayer Breakfast in Manchester Town Hall. Concert for Ghana Union of Manchester on 48th Independence Day. Concerts and solo work in various Cathedrals and Churches. Solo works from Elijah and Religious Songs in conferences in Los Angeles, USA. Singing at Weddings, Birthdays and other Special Occasions. 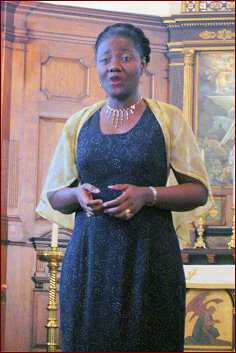 Soloist in concert to raise funds for Jematrone to tour England in 2005.